If a picture is worth a thousand words, the XV-2 with its large 17" display can be used to present more information to your customer. The XV-2 has the power and features that no other systems can match. It is the most powerful all-in-one system in the market, powered by Intel's Dual Core and Core 2 Duo. It has a blazing Intel 10/100/1000 BaseT network, with Intel's vPro technology for remote management. A wireless RF 802.11 network is also available.The XV-2 is also equipped with RAID-1 capability for data redundacy and protection. By utilizing 2 hard drives, your data will be continuously duplicated onto the second drive. If one drive fails, it will automatically run from the second drive, and reduce downtime. 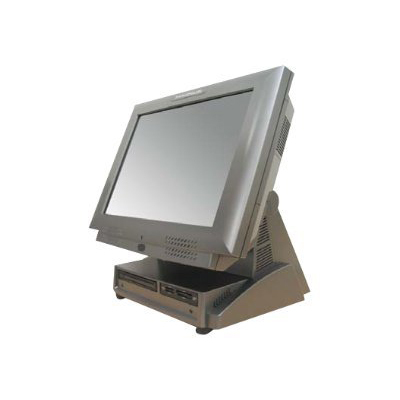 The XV-2 offers a wide range of expandability: 4 Serial ports, 6 USB ports, poweredUSB ports, and input devices such as magnetic card readers, optical drives, and multimedia card readers.